Vaishnavism (Sanskrit: वैष्णव धर्म) is a tradition of Hinduism. Its followers worship Vishnu or its avatars, mainly Rama and Krishna as the highest, or original God. This worship in different perspectives or historical traditions addresses God under the names of Narayana, Krishna, Vāsudeva or more often "Vishnu", and their associated avatars. Its beliefs and practices, especially the concepts of Bhakti and Bhakti Yoga, are based largely on the Upanishads, and associated with the Vedas and Puranic texts such as the Bhagavad Gita, and the Padma, Vishnu and Bhagavata Puranas. The followers of Vaishnavism are referred to as Vaishnava(s) or Vaishnavites. A large percentage of Hindus are Vaishnavas, with the vast majority living in India. Awareness, recognition, and growth of the belief has significantly increased outside of India in recent years. The Gaudiya Vaishnava branch of the tradition has significantly increased the awareness of Vaishnavism internationally, since the mid-1900s, largely through the activities and geographical expansion of the Hare Krishna movement, primarily through ISKCON and more recently, through several other Vaishnava organizations conducting preaching activities in the West. ↑ Goswami, B.K. (1965). 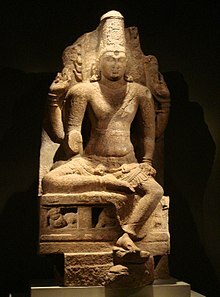 The Bhakti Cult in Ancient India. Chowkhamba Sanskrit Series Office. ↑ Page 1–Ramanuja and Sri Vaisnavism "In general, the Vaisnava Agamas describe Vishnu is the Supreme Being and the foundation of all existence." ↑ Mahony, W.K. (1987). "Perspectives on Krsna's Various Personalities". History of Religions 26 (3): 333–335. http://links.jstor.org/sici?sici=0018-2710(198702)26%3A3%3C333%3APOKVP%3E2.0.CO%3B2-0. Retrieved 2008-04-12. ↑ Dimock Jr, E.C. (1963). "Doctrine and Practice among the Vaisnavas of Bengal". History of Religions 3 (1): 106–127. doi:10.1086/462474. http://links.jstor.org/sici?sici=0018-2710(196322)3%3A1%3C106%3ADAPATV%3E2.0.CO%3B2-K. Retrieved 2008-04-12. This page was last changed on 16 March 2019, at 19:38.